This is the final piece in my series about vendors using physicians and other clinical experts in design, implementation, and support. I heard back from a few individual physicians working for vendors who asked not to be named. I’ve paraphrased their responses as well to give them a little more anonymity. Miriam works for a top-tier ambulatory vendor. Although she does primarily go-live support and physician-to-physician training, she also works with content designers on specific specialty-related projects. Although there are a large number of physicians in her company, she thinks that the physicians are underutilized in the development process. I would like to be involved more upstream in the development cycle. Since we’re in the field so much, we know better than the development teams as far as how the users work. She notes a high degree of physician turnover due to the 75% travel schedule her company requires. Jae is an internal medicine physician working as a consulting firm subcontractor. Although he would like to work for the vendor directly, he previously worked for a client and an anti-poaching agreement prevents him from being hired. He was involved in what sounds like a fairly messy practice breakup and the remaining partners would not give him a release, so he’s spending a year in what he calls “independent contractor limbo.” Although he does the same type of work as other physicians employed by the EHR vendor, his services are passed through the consulting firm to avoid actual employment. I do a lot of liaison work with sales prospects, especially sales demos since I still do some locum work and can say I am a practicing physician. I can also technically say I’m not on the company payroll, although I’m not crazy about how the sales team sometimes plays that. The contractor thing isn’t all bad, though. I probably make about the same salary as the employed physicians once you figure the difference in hourly wage vs. paying for my own benefits, but I probably have a lot more control over my schedule this way. I don’t think I have as much influence in development, though. There’s more to his very interesting story, and I must say I admire the vendor’s way of intentionally working around their no-hire agreement. Given the recent reader comments about a certain vendor’s no-hire agreements, it’s interesting to see it work the other way. I’ve been saving this early submission for a strong finish. Dr. Ryan Secan of HIStalk sponsor MedAptus sent information about his work as chief medical officer, including an action photo. I share many of your concerns about medical software, as I’ve often noted that the applications I’ve needed to use don’t seem to have had any input at all from a practicing clinician and are not designed with my workflow in mind. This is why I joined up with MedAptus last year. It was chance to help create software for physicians from the point of view of a practicing clinician. While my role at MedAptus includes participation in the sales process and acting as a liaison with client physicians, I also have an integral role in the design process. I understand physician needs for clean, simple, and intuitive interfaces that facilitate their work rather than hamper it. At MedAptus, we believe that our software should fit itself into physician workflow rather than forcing physicians to change their workflow to match the software. This has been particularly important as we prepare for ICD-10 implementation and the sheer volume of codes threatens to overwhelm the provider. Leveraging my clinical experience has allowed us to continue to put out a product that remains easy for clinicians to use despite the increasing complexities of medical billing and coding. The above photo is me with James Scott, who is the vice president of engineering at MedAptus. James and I meet regularly to discuss feature enhancements, usability design, and navigation. 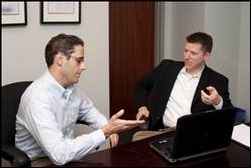 This was taken during a meeting in which we were reviewing changes to the physician interface of our professional charge capture application to support end-user ICD-10 code searching and selection. There were a few respondents who said they were going to obtain permission to send something but then never got back with me, so I assume the marketing and communications gatekeepers were not big fans of the idea. Or maybe, like my experience last week, they were pulled to work a double shift at the hospital. If they ever make it through the PR gauntlet, I’ll be happy to run their pieces. What a great idea (tongue in cheek.) After all who wants to use a race car program written by a librarian or a medical program written by a dog-groomer………………..